Double door, Self Close, with 2 Shelves. 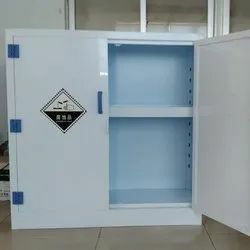 Cabinet for safe and approved storage of chemicals, toxic materials and other substances that have to be kept under lock in workrooms. Not suitable for storage of flammable liquids. The high-tech sentinel safety cabinet complies with OSHA standard, made in accordance with the requirement of NFPA clause No. 30 for storage of flammable and hazardous chemical material. A safe working environment is a primary concern in all workplaces. Laboratory staff regularly handles a variety of dangerous and health threatening chemicals. Hazardous substances must be stored safely. 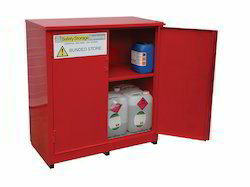 Labguard represents a number of premier makers of corrosive chemical storage cabinets. Conforming to both European and American standards, the cabinets allow you to work with complete safety. Chemical Storage is ductless. It has a filter with molecular technology. Available in different sizes. We are looking for project base inquiries.